I have a few little dogs and several cats, which means that I have several empty pet food bags at the end of any given month. 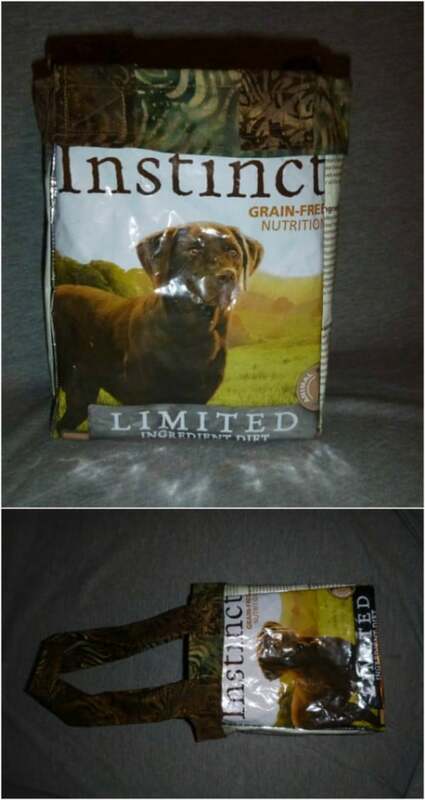 I recently thought that maybe there were things that I could do with those pet food bags, aside from turning them into impromptu trash bags, that is. So, I started looking around and would you believe that I found 10 clever pet food bag repurpose ideas? These are so great – you are definitely going to wish that you knew about these sooner. Whether you have dogs and cats or chickens, rabbits or anything else that takes feed, you are likely to have your own collection of pet food bags. You can turn those bags into everything from lunch sacks to Christmas stockings and these projects are all so very easy. It doesn’t even matter if you have large bags or small ones. There is going to be a pet food bag repurpose idea that is perfect for you. And, if you have cats then you have to check out these 25 fun and easy crochet projects for your cat. Not everyone has cats, so I have DIYs for other animals, too. 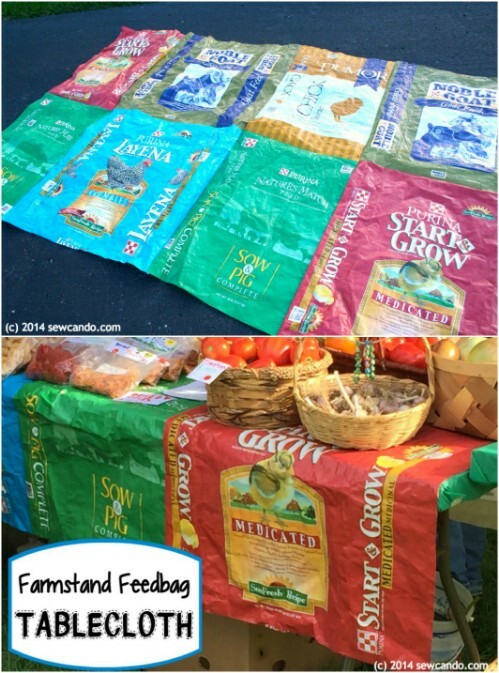 These pet food bag repurpose ideas are seriously life changing. Who knew that you could do so many wonderful things with an empty pet food bag? I sure didn’t but I am really glad that I do now. And, for those of you who prefer dogs to cats, make sure that you take a look at these 25 fun DIY dog toys that will definitely let you pamper your pooch. This little lunch sack is made from a repurposed bird seed bag and it is really cute. You can easily do this with some duct tape or something similarly strong enough to hold the seams. This would be such an adorable way for kids to take their lunches to school or for you to take yours to work. I found this one on Etsy. It’s got a nice long handle and you can get it for less than $10. 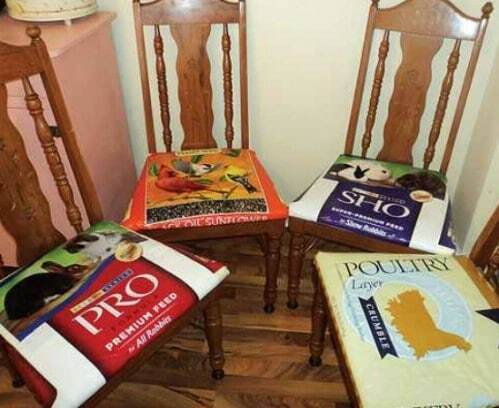 If you love farmhouse style furniture then these DIY chair seat covers that you make from empty pet food bags are perfect. These are super easy to make and they are waterproof so you never have to worry about things being spilled on them. They would look great in the dining room or you could create chair seat pad covers for your patio furniture with them, as well. These will definitely add to your DIY farmhouse furniture and décor. Turn those feed bags into these adorable little DIY Christmas stockings. I realize that it’s nowhere near Christmas but now is the time to think about DIYing some of your decorations. These little bags are perfect to get that rustic Christmas look and they are really easy to make. You could even use dog food or cat food bags to make DIY Christmas stockings for your pets! 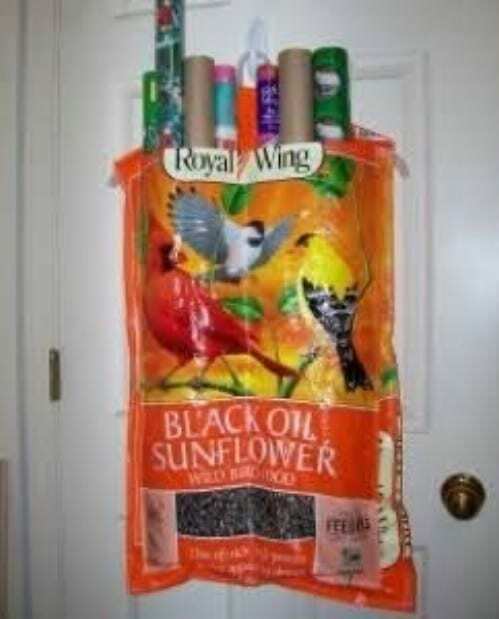 I could hardly believe that this great hanging organizer was made from repurposed pet food bags. This is amazing and would be great for the bathroom, mudroom or anywhere that you have a lot of stuff that you need to organize. You create pockets and you can make the pockets whatever sizes you need to hold all of your stuff. It’s great for the bathroom because the bags make it waterproof. You can turn those old pet food bags into the most amazing little tote bags. These would be so cute for taking your pets to the park. You can pack up their toys and other necessities in a bag that looks like pet food. How cute is that? I found this one on Etsy and you can get it for around $8. It’s a mini bag and is lined with a nice cotton fabric and has a fabric handle, as well. I love this idea of turning an old feed bag into a great gift paper organizer. 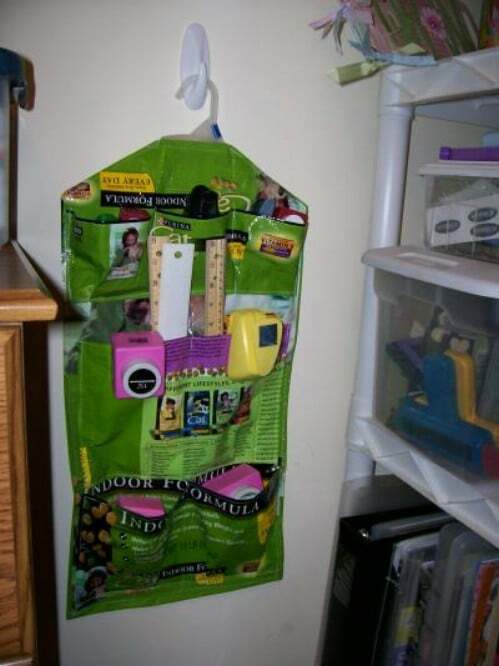 You can create this gift wrapping station with just one empty feed bag if that’s what you have or make a couple. You just have to sew down sections of the bag to make them the right size for sliding gift wrap into them. Then, just hang your organizer in a closet or anywhere you would normally keep it. If you grow your own garden, you can use those empty pet feed bags to create growers for potatoes, trees or anything else. You don’t even have to do a lot for this one. You just clean up the bags and then do your planting. This is a great, and really cheap, way to do your own container gardening and it’s perfect for those of you who don’t have yard space for a more traditional garden. These would work for just about any container friendly fruits and vegetables. I love this tablecloth that is made from empty feed bags. This would be great if you have a garden stand where you sell veggies or for throwing on your picnic table for those summer cookouts. The bags make it spill proof and it’s so easy to wipe off when you are finished with it. Seriously, if you want a great farmhouse looking tablecloth, this one is it and this is so easy to make. 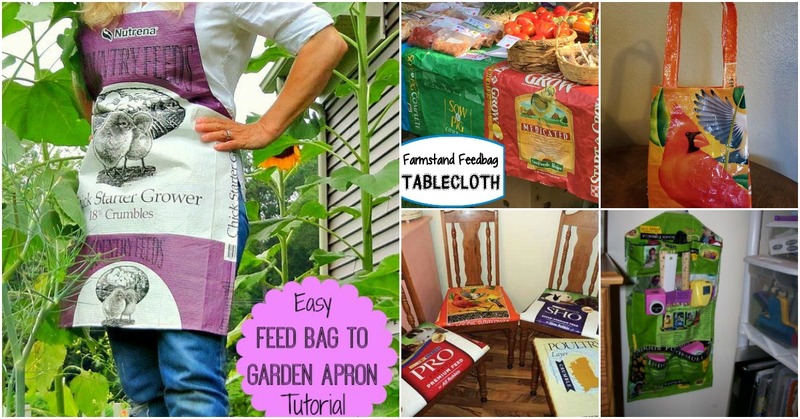 Garden aprons should be waterproof and easy to clean, which is the case with this one that you can make from repurposed pet food bags. This is a great little apron and it is super easy to make. You can do these in any size that you need and they are great for working in the garden to keep the soil and water from getting onto your clothes. 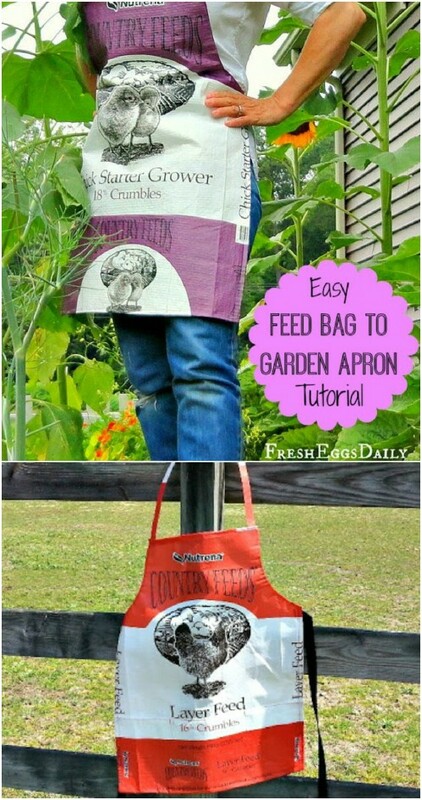 Plus, the feed bags make the perfect design for a gardening apron, don’t you think? 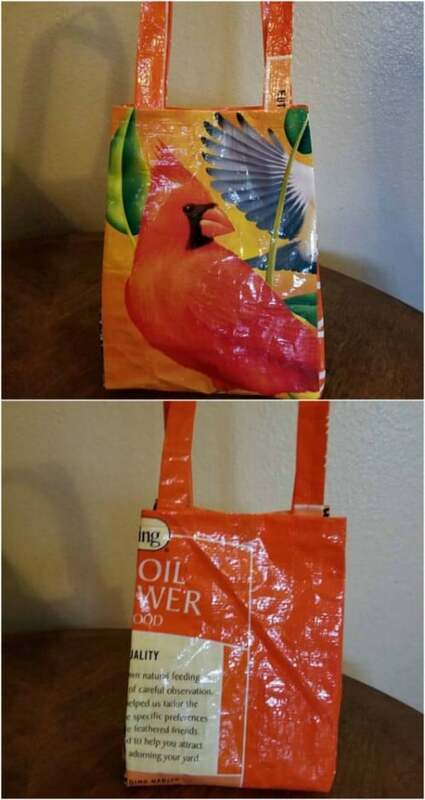 You can turn that empty pet food bag into just about anything that you want. Take this little wristlet or cell phone wall for instance. I found this one on Etsy. 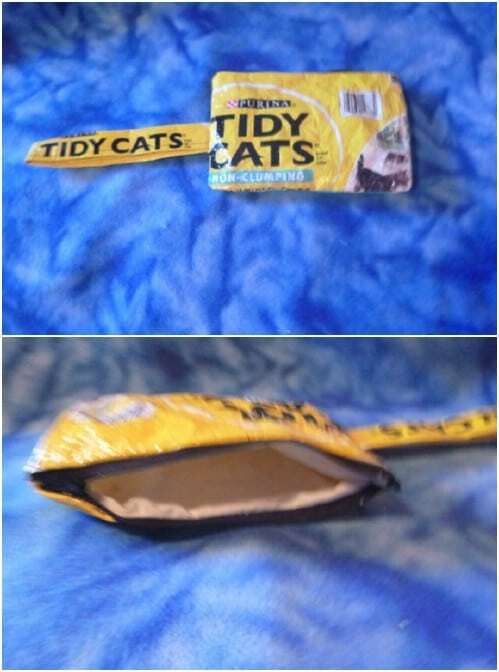 It’s made from a cat litter bag but you could easily make it from a cat food bag or any pet food bag that you have on hand. You can get this one for under $30 or just fold those bags yourself, glue them into place and make your own repurposed pet food bag wristlet.